Pope Francis is currently in the US for a visit, and he is making stops in New York, Washington D.C. and Philadelphia. 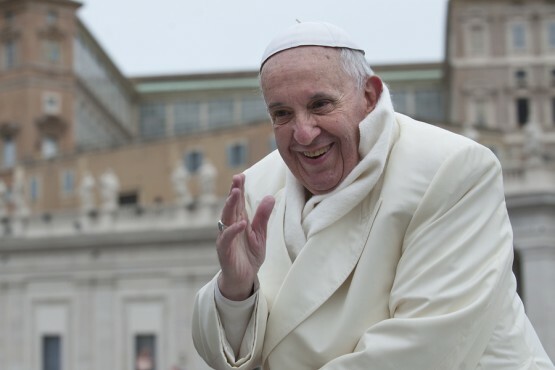 On 13 March, 2013, Pope Francis was elected the 266th Pope of the Catholic Church. Here are some fun facts that you might not know about the Pope. Pope Francis was born Jorge Mario Bergoglio in Buenos Aires, Argentina. He was the eldest of five children. He attended technical high school, from which he graduated as a chemical technician. As a teen, he used to play basketball. He has worked as a bar bouncer and a janitor to help pay for his studies in seminary school. He is a fan of soccer, tango and J.R.R. Tolkien. Pope Francis is the first Jesuit pope and the first pope from the Americas. He speaks Spanish, Latin and Italian fluently and understands German, French, Portuguese, English and Ukrainian. In 2001, as the Archbishop of Buenos Aires, he washed and kissed the feet of 12 patients with AIDS at an Argentine hospice. He is a legal citizen of three countries — Argentina (where he was born), Italy (because of his parents’ nationality) and the Vatican (which is considered a country). He loves cooking and used to prepare his own meals while serving as the Archbishop of Buenos Aires. Pope Francis speak Spanish or Italian with his family? Hi! We love Pope Francis! [p[e Francis is really cool because he believes in things that are very important. You’re awesome!! I hope the Pope can come to Academy Of Math And Science elem and meet all of the students! Also come to our fun night on Friday!! I love the pope because he is not jugging about gay marriage and other things christens think are ”sins” because God does not approve of it. I don’t believe in God but he is making me want to be a christen now. Also he has a Twitter! He is just cool unlike all the other popes! Just my opinion! I think Pope Francis is an inspiration to many Catholics and Catholic churches around the world. I love how he doesnt judge people and he is always happy. I love Pope Francis!!! I love the POPE!!!!! What are those!!!!!!!! OMG IM SO GLAD GOD PICKED HIM. HE REMINDS ME OF GRANDPA! SO WHO IS HIS FAVORITE j.RR TOLKEIN CHARACTER? Hi! We love Pope Francis! Pope Francis is really cool because he believes in things that are very important. You’re awesome!! I hope the Pope can come to Smokey Mountain Elem and meet all of the students!